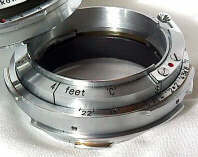 Use Contax and Nikon Rangefinder Lenses on Leica RF! Amazingly, with the proper adapter you can use Nikon Rangefinder and Contax Rangefinder lenses on your Leica Screw Mount or M Body and still have FULL rangefinder coupling!! Two such adapters were made in the 1950's. 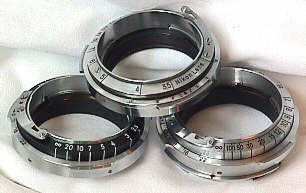 From England came two versions of the Cooke & Perkins adapter for Contax lenses, one for 50mm only, and another with the outer bayonet for wide angles and Teles as well. From Japan came the Orion adapter, available for both Nikon and Contax lenses. Interestingly, they have no "Orion" manufacturer's marking. As brought to my attention by Jeffrey Felton, later Orion adapters are labeled either "Nikon" or "Contax," while earlier Orion Contax adapters have no Contax markings. Today these classic adapters are VERY rare and VERY sought after by collectors and users alike. Recently one was advertised in the Leica Viewfinder catalog for $2,500. To put it in perspective, many experienced Leica people have never even seen these adapters, much less used them. Yet, they are GREAT if you can find them. Click here for more information on the Orion Camera Company. With the Contax-Leica Screw Mount adapter, the Nikon-Leica Screw Mount Adapter, and the standard Leica Screw Mount to M bayonet adapters, you can use most lenses of ALL the four great classical rangefinder systems (Contax RF, Nikon RF, Leica Screw Mount, Leica M) on your new Leica M--quite an important feat. 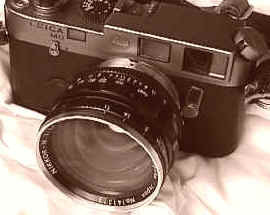 NOTE: The above discussion refers to the Contax Rangefinders from 1932 to 1965, NOT the current Contax G1/G2 system! In 2001 new manufacture copies of Orion adapters appeared in Japan. By 2004 they were discontinued due to lack of interest, themselves becoming collector's items like the original Orion adapters. The new adapters have a very high machined quality and finish. There are two adapters, one for Nikon lenses and one for Contax lenses. Each adapter resembles the actual helical found on Nikon or Contax cameras -- the Contax in all chrome and the Nikon in chrome and black. 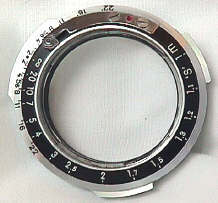 The Contax adapter does not allow the fitting of the 21 or 35 Biogon due to some sort of internal restriction. 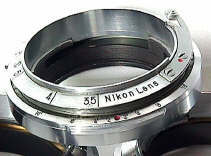 The Nikon adapter has a similar problem with the 35/1.8's rear elements making contact with the M6 body. New type Nikon Adapter. New Type Contax Adapter. New Adapters bottom level, Orion Adapter on top. 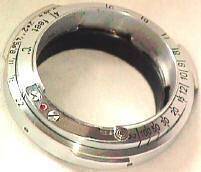 All have Leica screw mount which can be adapted to M mount with the standard Leitz bayonet adapters. Note the new type Contax adapter on the right has a M adapter attached. Pic on right shows adapter's Leica thread mount. All adapters shown in the near focus position. 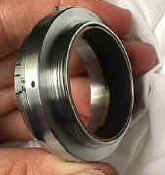 The original Orion adapter in the middle reveals helical threads on the sides, the newer adapters do not. 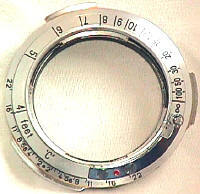 Early Contax adapters were not marked "Contax." Apparently after production started on Nikon adapters too, "Contax" was added. Distance markings in feet or meters. Side by side examination can show small variations in engraving styles. Having three of them side by side showed that the lettering styles were all very slightly different. 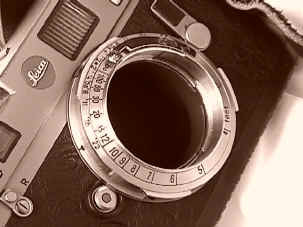 On some examples it is possible to view an engraved number on the inside of the mount, inside the helical. Other examples may not have this -- at least visible. It is unknown if this was intended as a serial #, an indicator of exact measured tolerances, or ?? The face of the adapter has two screws besides the to retaining the 50mm bayonet clip. Those separate screws may be in slightly different positions. When extended to the closest focusing position, the exposed side shows the helical threads. These threads are not continuous, but broken up in sections. The number of helical sections can vary from sample to sample. As a side note, NON-FOCUSING Contax mount to Leica Screw Mount adapters have been made over the years. I have seen at least four different variations, all of which had no manufacturer's marking. 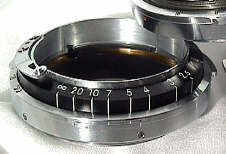 Here the external mount 50/1.1 Nikkor is mounted on a Leica M6. The TTL metering works. 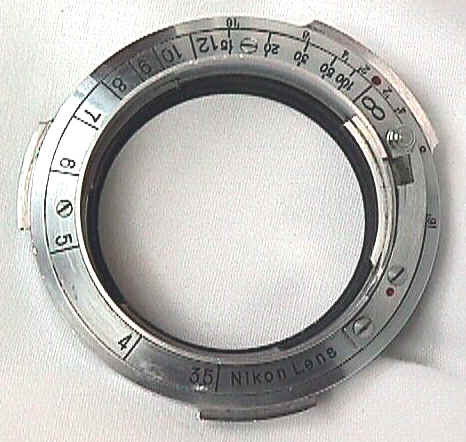 In other words, the Nikon-Leica adapter essentially makes the M6 the TTL Nikon SP! Well, kind of anyway. Revised: September 13, 2017 . Copyright � 1998-2006 Stephen Gandy. All rights reserved. This means you may NOT copy and re-use the text or the pictures in ANY other internet or printed publication of ANY kind. Information in this document is subject to change without notice. Other products and companies referred to herein are trademarks or registered trademarks of their respective companies or mark holders.